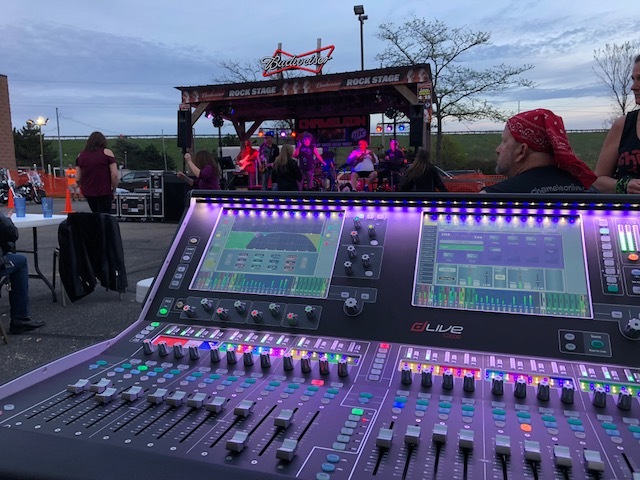 (Madison, WI) Exciting news from 608 Sound and Light, Dane County’s premiere provider of live sound and lighting production services – we are pleased to announce that we are dLive certified and now offer the world class Allen & Heath dLive mixing system. 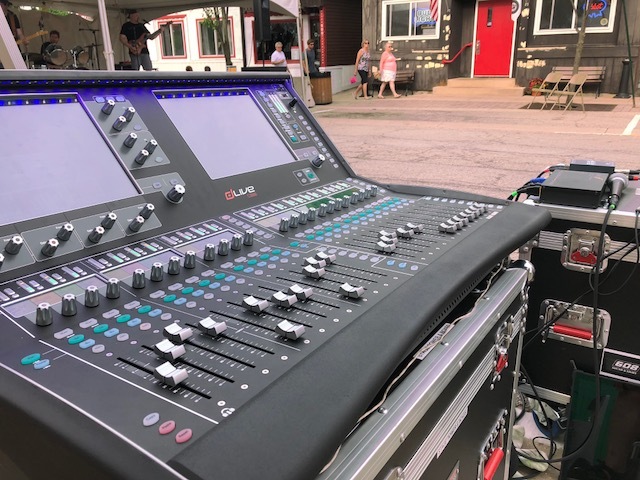 This state-of-the-art mixing console features DEEP processing with 96kHz audio resolution and less than 0.7ms of latency. 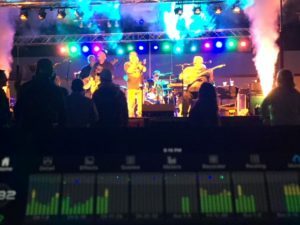 When combined with our Lake Processing LM44 speaker processor, you can rest assured that your festival, event, live show, or production will be heard better than ever before. Our new FOH console system delivers the cleanest, clearest, most accurate sound available. 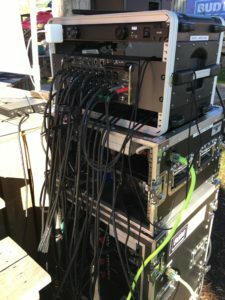 We can accommodate 40 input signals and 24 output feeds – more than enough for almost any live music performance production. 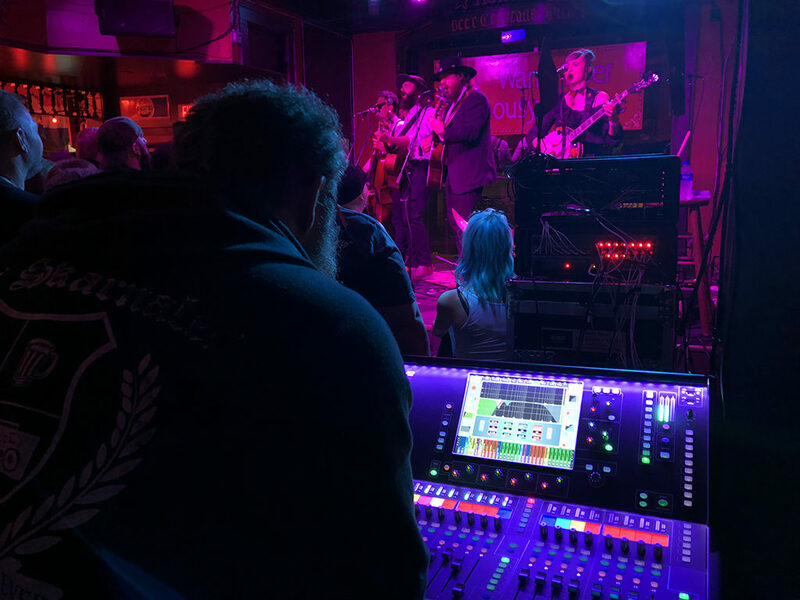 Working with The Dead South and our Allen & Heath dLive rig. 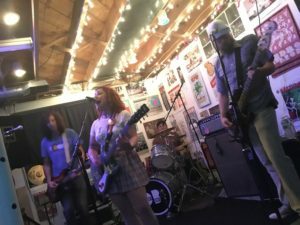 We’ve already used this new configuration with dozens of shows, and the reviews have been nothing short of fantastic. Clients that we have regularly worked with have noticed the improvement in sound clarity. 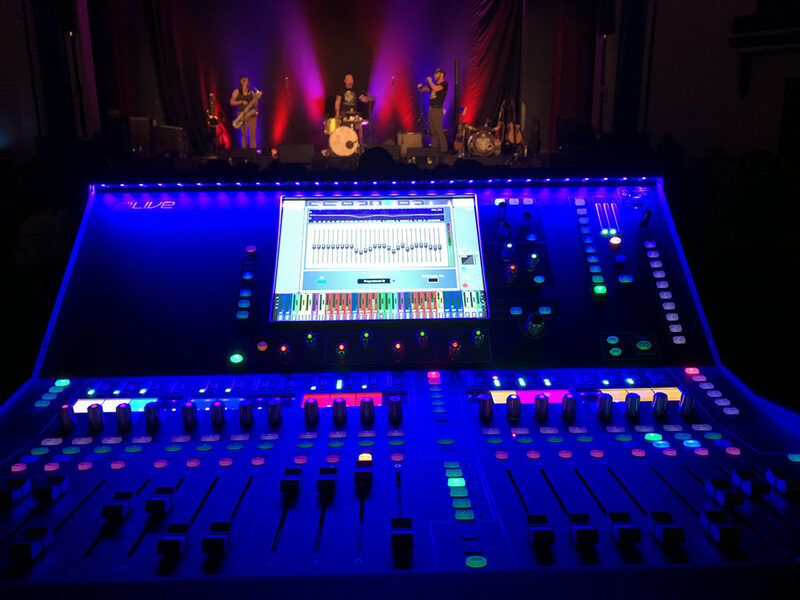 Audience members have also commented on the difference, and that’s really saying something because our Midas DL32 and Behringer X32 systems sound really great on their own! 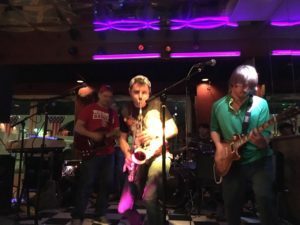 Come see and hear for yourself how good live music can sound with 608 Sound & Light! Be sure to check our Events page for upcoming shows – swing by and say hi! 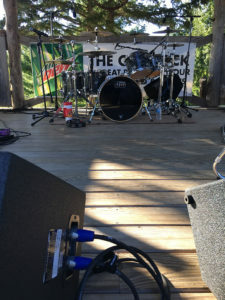 It’s almost time for outdoor music! We’re just a few short months away from summer music season here in beautiful Madison, Wisconsin and hope you’re as excited as we are! 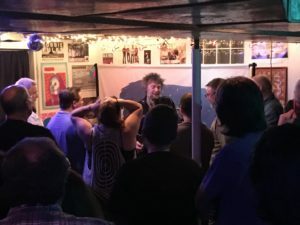 We are so lucky to have so many incredible live sound events in the Dane county and Madison area; we’ve done our fair share of traveling to other cities, and it certainly seems like southern Wisconsin leads the country in awesome live music festivals. Our 2018 calendar is nearly full already – there’s a great deal of planning and preparation that goes into every one of the many festivals, fairs, and other music fests. Most of the event organizers begin planning for next year’s event within a few days of completing their current event – crazy, right?! 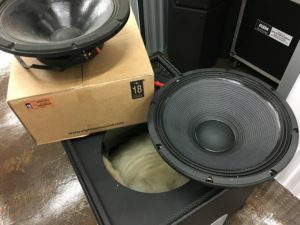 We can hint that some newer, even more powerful JTR Speakers Subwoofers are en route to us, along with a new FOH mixing rig. It’s going to be incredible! 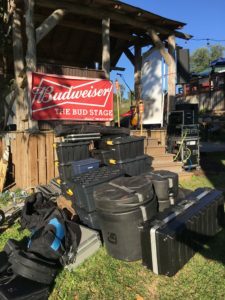 In addition to the summer music scene, we’ll be providing live sound and lighting production services for AXPONA 2018 – they invited us back again, and we are honored by the request. 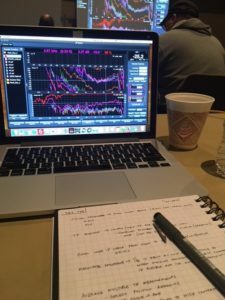 That event takes place April 12 – April 15, 2018 in Schaumburg, IL and is definitely worth checking out, especially if you’re an audio enthusiast. Thanks for taking the time to read this update, and as mentioned, stay tuned for more updates! Big things are in the works!! 608 Sound and Light is proud to announce a new service offering: acoustical analysis and correction. 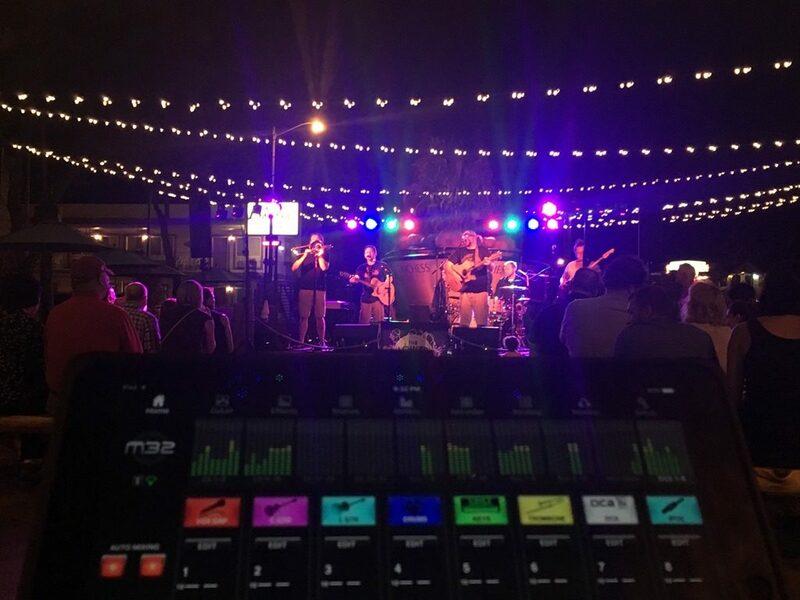 Whether you operate a live music venue, a bar, a club, a house of worship, an auditorium, or any other type of establishment, 608 Sound and Light can help make your space sound better than ever. Working with Rational Acoustics Smaart V8 software. 608 Sound and Light just completed a multi-day, intense training program for Smaart V8 analysis software from Rational Acoustics. Smaart is the industry standard for measuring and evaluating room response – it quickly identifies problem areas and combined with our knowledge and experience, we can recommend various treatments to help maximize the sound quality of your environment. 608 Sound and Light uses Smaart to measure every performance space that we work in. 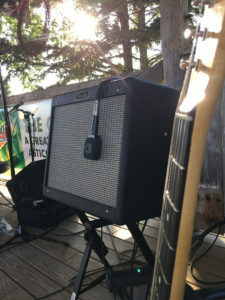 This ensures quality sound for every one in attendance. By utilizing Smaart V8, we can find “hot spots,” “nulls,” and everything in between. We also utilize Smaart to provide a comfortable experience for everyone in attendance. You’ll get quality sound without any harshness, shrillness, or boominess. 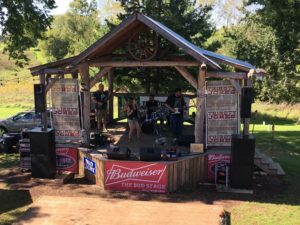 Give us a call or send an e-mail to see how 608 Sound and Light can maximize the performance of your venue or establishment! We are proud to work with Full Compass for all of our equipment needs. 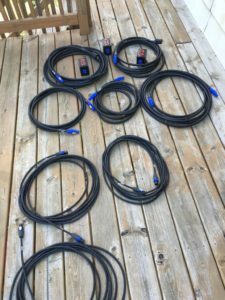 They’re local to us, they have an incredible selection of in-stock gear, they are more than happy to answer our questions or arrange for demonstrations, and their prices are top-notch. They’re also celebrating their 40th year in business, and as part of that celebration, they asked us to be interviewed for one of YouTube video segments. The video was released earlier today, and wow – color us flattered!! We really are fortunate to have such great service and support, and we love working with Full Compass (and especially Caleb Hopwood, our sales rep). It’s a great company that treats us more than fairly and is always willing to help. Thanks everyone! Happy 40th and here’s to 40 more!!! Here’s the video that they shot and produced, featuring us. Enjoy! 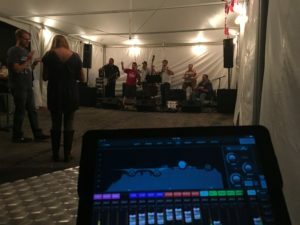 When it comes to live sound production, there are a great number of technological tools that can help make or break a show. 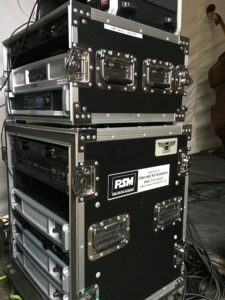 608 Sound and Light has worked hard to carefully audition, select, test, and implement the best equipment available to ensure a flawless performance each and every time. 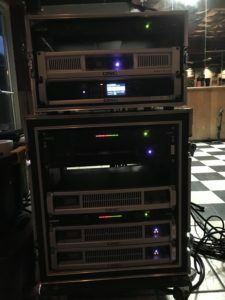 We have long been fans of the dbx DriveRack product, and couldn’t imagine running shows without their loudspeaker management processing system. 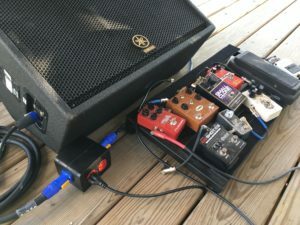 When the VENU360 was introduced, it promised great things – 3×6 input/output matrix, excellent sound quality, wireless management, a bunch of wizards (auto EQ, auto level, AFS, etc), and room for 99 custom presets. 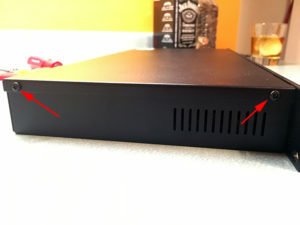 After a while, we started to notice a few odd problems with our dbx VENU360. It would occasionally drop all sound output, while otherwise appearing to function normally. The input and output meters would flash, the main menu and display would work properly, but there wouldn’t be any sound output. It was if the unit was muted, without actually being muted. 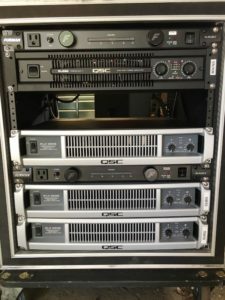 We scoured the internet, contacted dbx, and did some experimentation on our own. 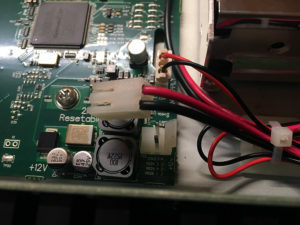 We eventually discovered that the issue was related to a bad connection between the main board and the power supply (PSU). 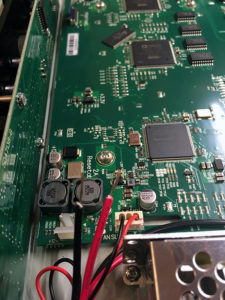 Apparently, the 2-conductor connector that supplies power to the mainboard would lose contact, which in turn caused all sorts of performance issues. The most notable and common issue was muted sound or muted output during otherwise normal operation. The issue became most noticeable when the unit was subjected to heat (sunlight, HVAC, etc). 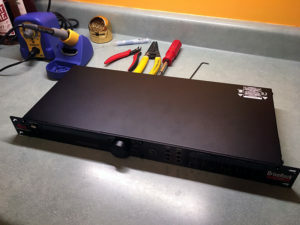 Our unit went back to Harman International for repair (it was under warranty). While it was out for service, we purchased a second unit to serve as a back-up. When it arrived to us, we noticed that it had not been updated/repaired so as to prevent the muting issue. So, we decided to repair it in house, and took a few pictures along the way. We hope that you’ll find this information helpful, should you ever encounter a similar issue. Disclaimer: perform this work at your own risk. Make sure the unit is completely unplugged from any electrical source prior to beginning work. If you are not comfortable and adept with electrical component repair, soldering, or general repair work, please contact Harman International. Note that performing this work on your own may void any manufacturer’s warranty. For any issues or concerns, please contact dbx and/or Harman International first. This blog entry is for entertainment purposes only. 608 Sound and Light assumes no responsibility for any work you may choose to perform. 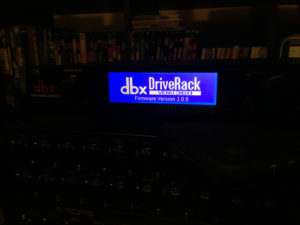 Here’s a picture of our dbx DriveRack VENU360, and all of the tools you’ll need to complete the job. Starting on the left side of the unit, locate two (2) Philips #2 screws and remove them. 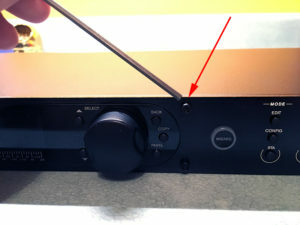 Spin the unit around, and you’ll find another Philips #2 screw on the back side of the unit. Remove this screw. Spin it again, and on the right side (with fan), you’ll find two more Philips #2 screws. Remove them both. Note, you do not need to remove the screws holding the fan guard. Leave them in place. Spin it once again, and on the front, you’ll find a 7/64″ hex head screw, just above the rotary knob. 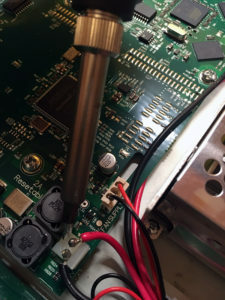 Using a hex driver, remove this screw. The lid will now lift off from the unit. 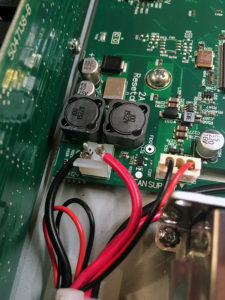 Locate the power supply and main board connector. They can be found near the right front corner of the unit. 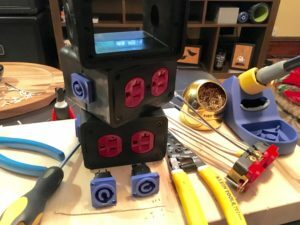 The connector will likely be loose and will freely wiggle/move around. 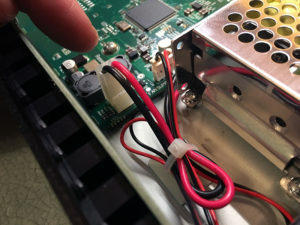 Carefully disconnect the connector by gently pulling out on the connector latch while lifting on the connector. The latch portion is connected to the main board, and will move ever so slightly “outward” toward the outside of the case. 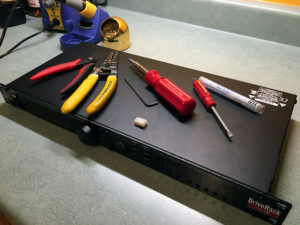 With the connector disconnected, use a sharp wire cutters to cut the connector. Cut the wires as close to the connector as possible, so as to preserve as much of the original wiring as possible. Then strip the wires so that approximately 1/2″ of wire is exposed. Be certain to maintain the proper orientation of the wires. The black wire will be positioned on the terminal closest to the front of the unit (control side). The red wire will be positioned on the terminal closest to the back of the unit. Carefully wrap each wire around its respective terminal. Pay close attention so that any wire strands don’t “jump” terminals. You do not want any wires from either wire touching the opposite terminal. 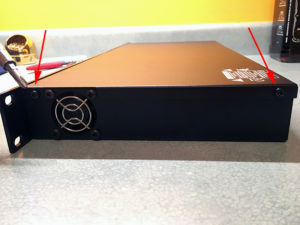 We used a small flat blade screwdriver to help “shape” the wires and press any strands closer to their proper terminal. 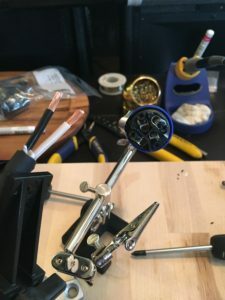 Prepare your soldering iron, following proper soldering techniques. We utilized a Hakko FX-888D unit, with the temperature set to 700F. We used a pencil soldering tip and high quality solder. We carefully soldered each wire to its respective terminal. 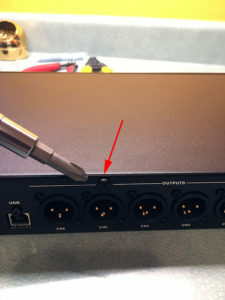 Do not use any more solder or heat than necessary, and do not touch the soldering iron to any part of the unit, other than the terminals. When you’re finished soldering the connections, things should look similar to this. Reassemble the unit, making sure to replace all of the screws into their proper location. Power the unit up, and test for proper function. You might want to run some “burn in/test” music for an hour or two to make sure everything is working as expected. 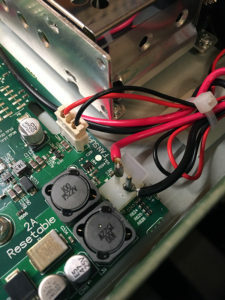 The issue with the mainboard/PSU connector is well known and documented across various forums and user groups. 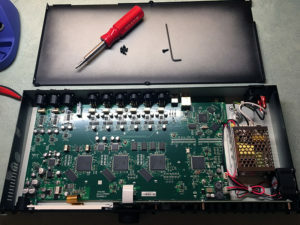 If your dbx DriveRack VENU360 is out of warranty and is exhibiting similar symptoms, you may want to try to fix the unit on your own. Please note that in doing so, you assume any and all risk. If you have any doubts or concerns about performing any type of diagnostics or repairs on your dbx unit, please contact dbx and/or Harman International directly.